The big serpents loose in the Florida swamplands have been in the news lately and people down south are understandably concerned about these big constrictors ( please see note below). They are a real hazard. 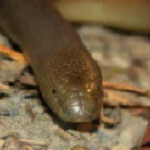 Now I doubt that any of these big snakes could survive one of our Northwest winters (or even summer for that matter) but it is worth noting that we have a very interesting constrictor of our own – the Rubber Boa, Charina bottae. At a maximum length of less than three feet our boa constrictor is hardly a threat to anything but mice and other very small animals. They are, however, true constrictors and member or the Boidae family of snakes that include the giant pythons and boas of the world. 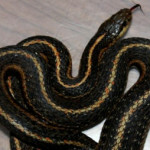 As you may suspect our representative gets its name from the rubbery feel of its scales and body. 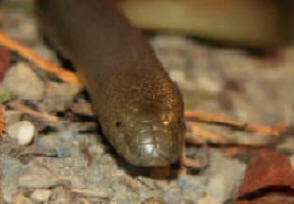 As you can see from the photographs the scales of this snake are large, quite smooth and glossy. 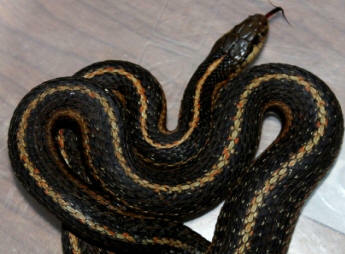 Compare this to the rough keeled scales of the garter snake and the difference in texture is obvious. 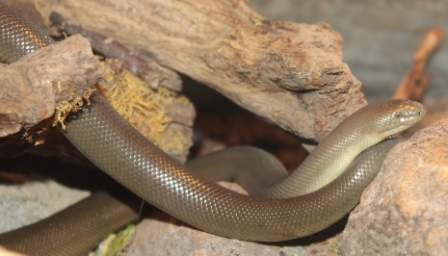 Rubber boas are not rare or endangered but the casual observer should not expect to see one. 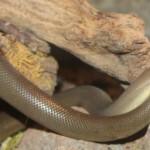 Although they are well adapted swimmers and climbers and inhabit many different types of terrain these snakes tend to be nocturnal and spend the daylight hours tucked away underground or hiding under logs. They also tend to clump together in large numbers in certain places but seem to be non-existent in others. NOTE: Although this recent invasion is chalked up to snakes that escaped during Hurricane Andrew in 1992 I believe the actual invasion began long before. In the 1970s during a visit to Everglades National Park I saw large iguanas lounging around the swamp as if they owned the place already, and I witnessed spider monkeys running loose on private zoos. And I must confess that as a teenager in Orlando I once released a South American boa that I had as a pet. Peterson Field Guide, Western Reptiles and Amphibians, Third edition.